The Hague Congress or the Congress of Europe, considered by many as the first federal moment of the European history, was held in The Hague from 7–11 May 1948 with 750 delegates participating from around Europe as well as observers from Canada and the United States of America. The Congress brought together representatives from across a broad political spectrum, providing them with the opportunity to discuss ideas about the development of European political co-operation. Important political figures such as Konrad Adenauer, Winston Churchill, Harold Macmillan, Sir David Maxwell-Fyfe, Pierre-Henri Teitgen, François Mitterrand (both ministers in Robert Schuman's government), three former French prime ministers, Paul Reynaud, Édouard Daladier, Paul Ramadier, Paul van Zeeland, Albert Coppé and Altiero Spinelli took part. A broad range of philosophers, journalists, church leaders, lawyers, professors, entrepreneurs and historians also took an active role in the congress. A call was launched for a political, economic and monetary Union of Europe. This landmark conference was to have a profound influence on the shape of the European Movement, which was created soon afterwards. The Spanish statesman Salvador de Madariaga proposed the establishment of a College of Europe at the Congress. This would be a college where university graduates from many different countries, some only a short while before at war with each other, could study and live together. The Congress also discussed the future structure and role of the Council of Europe. Teitgen and Maxwell-Fyfe were instrumental in creating the Convention for the Protection of Human Rights and Fundamental Freedoms at the Council of Europe. The Congress provided the means to heighten public opinion for European unity. On 20 July 1948, at the Hague meeting of ministers of Western European Union, Schuman's Foreign Minister Georges Bidault proposed the creation of a European Assembly (realized in the later Council of Europe) and a customs and economic union (the later European Coal and Steel Community and the two communities of the Treaties of Rome). Thus the conclusions of the Congress became French government policy and then the subject of European governmental policy. Marcel Pilet-Golaz, Winston Churchill, Grigore Gafencu, Édouard Daladier, Albert-Édouard Janssen, Antony Eden, Juraj Krnjevic, Knut Kristensen, Indalecio Prieto, Hjalmar J. Procopé, Paul Ramadier, Paul Reynaud, Tadeusz Romer, Paul van Zeeland, Jacques Augarde, Gustav Heinemann, Johannes Hoffmann, François Mitterrand, Konrad Adenauer, Léon Chevalme, Alphonse Colle, Maurice Schumann, Auguste Cool, Henri Lambotte, Henri Davezac, Ivo Duchacek, Carl Romme, Gaston Tessier, Zivko Topalovic, Édouard Bonnefous, Georges Chevrot and, Paolo Giobbe; André François-Poncet, Marquess André d’Ormesson, Nicolò Carandini, Étienne Gilson, Charles Morgan, Bertrand Russell, Salvador de Madariaga; Raymond Rifflet, William Rappard, Walter Hallstein, René Capitant, Léon Julliot, Lord Moran, Michel Polonowski, Émile Borel, Gilbert Murray, Peter Fleming, Henry de Ségogne, Jacques Rueff, Maurice Allais, Jan Tinbergen, Harold Butler, Louis Salleron, Jacques Lacour-Gayet, Pierre Hély d’Oissel, Pieter Otten, Adrian Boult, Paul Landowski, Raymond Aron, René Courtin, Walter Layton, Pilsudski, Raymond Silva, Gilberte Brossolette, Frances L. Josephy, Germaine Peyroles, Claire Saunier, Edmond Michelet, Jean de Suzannet, Hugh Delargy, Jean Mathé, Jean Buchmann, Henri Koch, Altiero Spinelli, André Voisin, Robert Bichet, Alexandre Marc, François de Menthon, Luc Durand-Réville, Robert Lemaignen, Edmond Giscard d’Estaing, Henri Cangardel, Georges Le Brun Kéris. ^ Borchardt, Klaus-Dieter (2010). The ABC of European Union Law. doi:10.2830/13717. ISBN 978-92-78-40525-0. 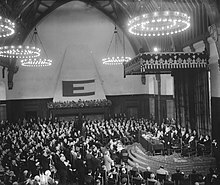 Wikimedia Commons has media related to Congress of Europe in The Hague (1948). This page was last edited on 18 March 2019, at 11:11 (UTC).